The state of Tamil Nadu (Tamil country), once called Madras, is located on the southeastern coast of India. Inhabited by the Tamil people since 500 BC, it still holds fast to its regional language, Tamil, used along with Hindi (the national language) and English on official signs. The state is home to a rich history of architectural and literary works achieved during the powerful dynasties of the Chera, Chola and Pandya. That heritage, threatened with extinction during a period of European colonization, has thankfully been saved by strong social reformists and conservationists for us to enjoy in the 21st century. The Tamil alphabet was adapted to typesetting and cast in the mid-1500’s. Portuguese missionary, Henrique Henriques, printed the first Tamil book in western India in 1577. British Colonists did not allow Indian citizens to own printing presses until the 19th century. The British Parliament was advised to obliterate Indian culture and religion in an infamous report by Lord Macaulay, who suggested the following to his superiors back in England, “… I do not think we would ever conquer this country unless we break the very backbone of this nation, which is her spiritual and cultural heritage, and, therefore, I propose that we replace her old and ancient education system, her culture, for if the Indians think that all that is foreign and English is good and greater than their own, they will lose their self-esteem, their native self-culture and they will become what we want them, a truly dominated nation.” Missionaries were dispatched to introduce Christianity to India as part of that scheme. When Queen Victoria assumed the role of Empress of India in 1858 westernization accelerated. Railroads and the telegraph reduced travel and communication time across the vast continent and English was instituted as the official language (facilitating more contact between India and the Western world). Indians, however, were not convinced that British ways were “good and greater than their own.” To the contrary, Indian scholars began to rediscover their indigenous history and literature spawning an Indian Renaissance, a resurgence of national pride and an urgency to expel the colonists. Many dedicated Indian patriots and martyrs would perish in the pursuit of independence over the next century. Gandhi’s image always present, seen here on a newspaper in neighboring state of Kerala. The script used is Malayalam, also part of the Dravidian group that includes Tamil. About half of the museum space presents the arc of Gandhi’s personal and public life. We learned that it was in Madurai that Gandhi chose to adopt the dhoti, a simple Indian peasant garment, as a symbol of his solidarity with all classes of his countrymen. He spun the thread for his personal clothing on a spinning wheel, setting an example to urge Indians to resume making their own goods. The exhibit concludes with a small room containing a single profoundly moving artifact—the blood stained dhoti that Gandhi wore on the day of his assassination. The whole experience gave us a deep respect for the combined efforts of Gandhi and his predecessors who helped India regain self-rule in 1947 and preserved the rich cultural heritage of India. Sarasvati, goddess of knowledge, music, arts and science. (r) Library founder Serfoji II, forced out of power by the British, devoted his life to culture and learning. 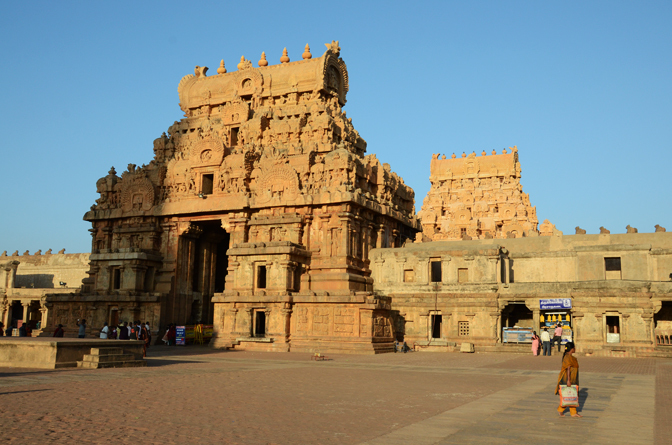 About 200 kilometers north of Madurai is Thanjavur, a cultural mecca that evolved under the patronage of kings who supported religion and the cultural arts of music, dance, art and literature. The city is most known for its stunningly beautiful Brihadisvara Temple built during the Chola dynasty by Raja Raja the Great (985-1016). We visited the enormous temple complex at dusk while the setting sun best emphasized the sculptural facades. The capstone of the high tower was positioned by hauling the stone along a 6 km ramp. Thanjavur priests and scholars were active writers of religious and scholarly manuscripts, many composed in Sanskrit, the liturgical language of Hinduism. The nearby royal palace stored much of their work in a library named Sarasvati Mahal during the Nayak period of the 16th century. A later ruler, Raja Serfoji II (1798-1832), enlarged the collection by dispatching pandits (experts in Sanskrit) to buy or copy Sanskrit manuscripts from Northern India and other important Sanskrit centers. Serfoji, an ardent bibliophile, studied English, French, Italian and Latin under Danish missionary, Reverend C. F. Schwartz. In 1805 he set up a printing press in 1805 in the palace and equipped it with “cast Devanagari type imported from Madras”. (Devanagari is one of several writing systems used for recording Sanskrit.) Other sources describe the type as stone type. “The Types and Blocks were prepared using soft stone and hard wood.”  The press, known as Navavidyakalanichi, was inaugurated with an edition of Maratha Pachanga (The Almanac) produced on European paper. Serfoji also ordered translations of English story books for educating village children.The royal library eventually passed into public hands upon the death of the last Maratha queen in 1983. 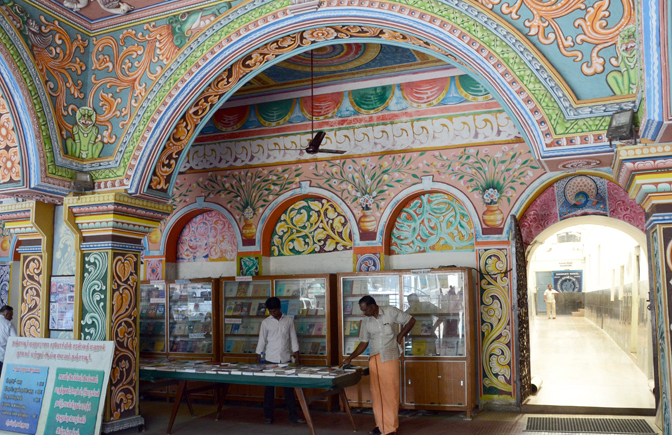 The library is still situated within the royal palace complex in the heart of Thanjavur. We arrived on a Tuesday before the 10 am opening (There are a number of conflicting sources on the opening days and times. Tuesday seems the most reliable). We first viewed the palace art gallery next door which was undergoing extensive renovation—a work in progress that will be far superior after completion. The library however was well worth the visit. All sorts of books are on view: palm leaf books, manuscripts and printed bound books of diverse subject matter: Vedas (Hindu scriptures), epic poems, purana, (histories of the universe from creation to destruction) philosophy, modi (business registers), jyothisa (astrology), medicine, literature and scientific illustrations. Well-known works including the Bhagavad Gita, the Mahabharata and several versions of the Ramayana (Rama’s Journey) including one known as Valmiki Ramayanam which features all 24,000 verses written in Grantha script so miniature that the letters are impossible to read with naked eye. (A magnifying glass is suspended above for viewing.) Some of the palm books are entirely script while others are illuminated with a single color or elaborate multiple color decorations. Also on display are maps, early Western books and curios such as the smallest and largest palm leaf books. It is a bit confusing to sort out some of the facts about the collection. According to a library-produced pamphlet for tourists the oldest dated palm leaf manuscript, the Andhrabhagavatam, by Telugu poet Bammera Pothana, is dated 1432 (although Pothana’s lifespan was 1450-1510). Yet a book the library published in 2011 the oldest palm leaf manuscript is the Gadyachintamani written in 1550. Bhamati (1468) the oldest paper manuscript in the collection echos palm leaf proportions. (r) A sample of Marathi script, one of the 11 scripts in the library collection. Bhavartha Ramayana, a “stone printed” edition from the press of Serfoji II in 1803. We were most fascinated by the books made from palm leaves, a common book material in ancient India. The process of preparing a palm leaf for writing is labor intensive: the dried leaves are cut to equal lengths, drilled for the string binding, boiled in water, dried again and then buried in sand before a final polish with conch shells. A salaka (metal stylus) was used to inscribe the text into the leaf surface and then washed with a mixture of charcoal and vegetable juice to add contrast to the letters. The finished leaves were smoked over a fire and coated with juices to provide protection from insect damage. In the 1700’s a plant-based paper was beginning to be manufactured as a substitute for palm leaf material. The paper manuscripts were written using wood, bamboo or quill pens with an ink that was a mixture of lamp soot and extracts of the needle bush (Vachellia farnesiana). The natural preservative for paper was a bath in a turmeric and water solution. Today the library’s mission includes preservation of the collection, recording it on microfilm as well as transcribing the ancient texts into computers for publication. Anxious to know more we asked to see some of the work behind the scenes. We were grateful for the limited access granted by head librarian, Dr. S. Sudarshan, to see the transcription and preservation processes. We were introduced to one of the Telugu pandits, Mr. D. Ravi, who graciously conducted a short tour of the four manuscript divisions which are divided by language (Sanskrit, Tamil, Marathi and Telugu). 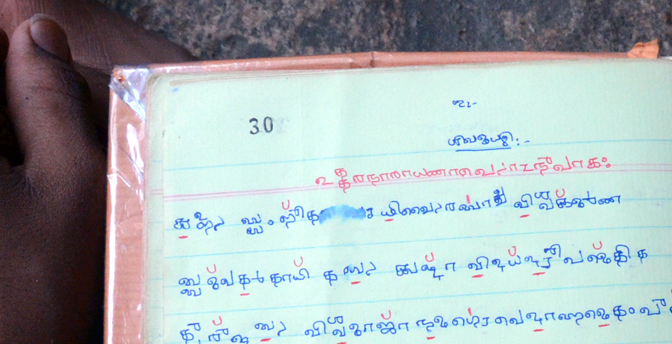 One of the pandits was translating and hand transcribing content from an ancient palm leaf book. She was handwriting the entire text in ball point pen on paper, preparing it for electronic entry in the nearby computer center. 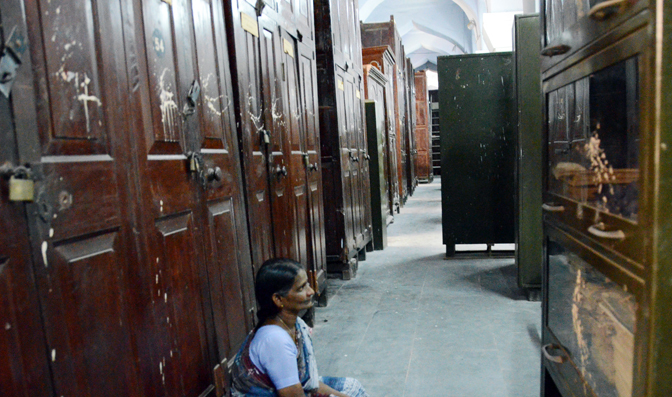 Large wooden cabinets hold the manuscripts along one side of the archives. Although there is no air-conditioning or climate control the storage is relatively stable deep within the thick stone-walled building. As a precaution if the temperature exceeds 90 degrees the palm leaf pages are not handled. (The library computers are pampered with air-conditioning inside a separate glass walled section.) Hopefully environmental control will come for the manuscripts in the future, but for now the collection is preserved using traditional natural methods. Each palm-leaf is routinely cleaned with Citronella, an extract of lemon grass which insures flexibility of the leaves and acts as an insecticide. If the cleaning process lightens the lettering it is refreshed by a wash of black ink and oil. Approximately 60 of the 25,000 palm leaf manuscripts are cleaned each day. Mr. Ravi opened the first storage cabinet and out flowed the lush odor of the Citronella. Each manuscript is individually wrapped in white linen, tied with a string and identified on the outside. Our guide kindly untied one to demonstrate the flexibility of a preserved leaf that was several hundred years old. In another section of the building paper books were in various stages of repair. Stabilization of holes and tears in delicate pages is achieved by layering a piece translucent “Japan paper” (we suspect it was rice paper) over the entire page and then trimmed. A small group of men was binding newly printed books containing the text from an ancient palm leaf book manuscript. 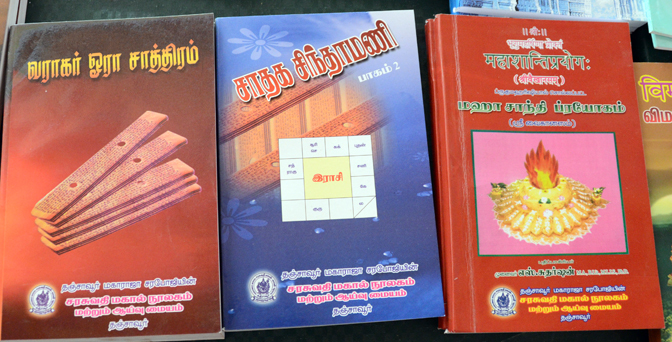 We saw similar reprints for sale in the library bookstore and in shops inside temples all over Tamil Nadu. The library has published many of the palm books in the collection. The image of the palm leaf version is often on the cover. Although India has one national language, Hindi, it also recognizes 22 regional languages out of it hundreds of local tongues. Without any expertise in this area we are reluctant to wade into the topic of Indian languages but what we surmise is that there are two major branches of language development in Tamil Nadu. One is the Sanskrit family—a historical language related to modern Indian languages in much the same way that Greek and Latin connect with western languages. Separately there is the Dravidian family of languages, 85 in number including the Tamil, Telugu, Malayalam systems that we observed in the Sarasvati Mahal library collection. What muddles the water is the fact that some of the Dravidian languages can be used to write Sanskrit while other can reproduce the full range of sounds in Sanskrit. Although it is an ancient language, Sanskrit is still used in some instances in the modern world. For example when yoga teachers instruct their students, they frequently use the Sanskrit names for positions, ie: Adho-mukha svanasana is Sanskrit for downward dog. Om, ॐ, is also a Sanskrit word. Student priests. Three lines of white indicate their affiliation with Shiva. The man in the picture behind them is their guru. A more academic use of Sanskrit is in religious practices, including Hinduism. We were able to observe Sanskrit as a living language while visiting a traditional Vedic school dedicated to educating boys of Brahmin birth to become Hindu priests. While one does not expect boys between the ages of 10 and 18 to be interested in conversing with older adults these fellows were a respectful and inquisitive group. They were enthusiastic in sharing their Sanskrit lesson books using Grantha script, a once common form now replaced in the secular world with Devanagari script. They were a lively group but when it was time for their twice daily chanting and prayer ceremony they scrambled into their places, executed some nostril breathing exercises and then flipped open their books to chant in unison as a cohesive whole. Be not like the frog in the well. The frog in the well knows nothing bigger or grander than its well. So are all (bigots) narrow-minded persons, they do not see anything bigger than their own wells. Sri Ramakrishna (1836-1886). Unless otherwise noted, all images 2013 © designhistory.org. The Indian Antiquary, page 194 June 7,1872. 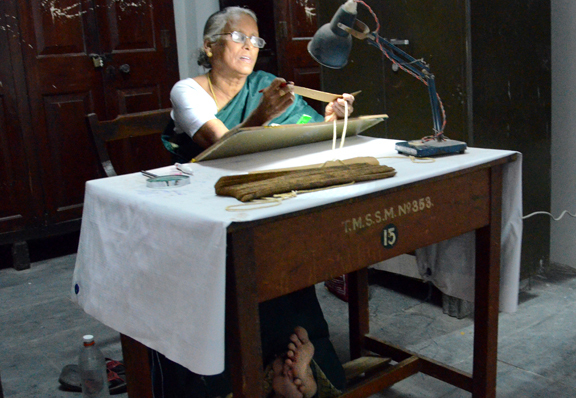 Srinivasanm G, Treasure Trove in Thanjavur, The Daily Hindu, November 7, 2011. Wujastyk, Dominik, Thanjavur Library – A Realm of Knowledge, The Sampradaya Sun-Independnet Vaisnava News, Oct 14, 2012. Perumal, Dr. P, Historical Sources in Thanjavur, Maharaja Serfoji’s Sarasvati Mahal Library, Blog, April, 2012. 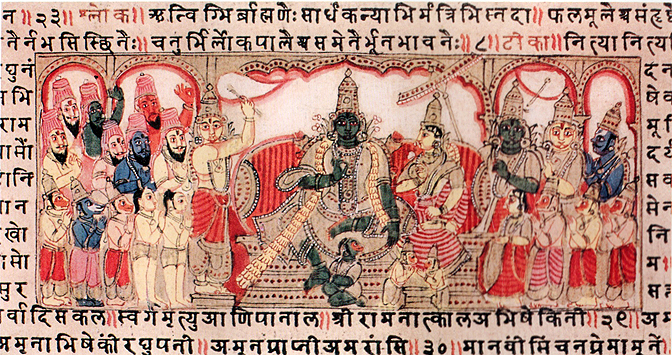 Krishna, Nanditha, Painted Manuscripts of the Sarasvati Mahal Library, Thanjauvar, 1994. This is fascinating. Thank you for putting us onto it. Looking forward to exploring this and to a chance to see some more of your photos from India.